VANCOUVER, BC--(Marketwired - September 07, 2017) - INDOCHINO, the world's largest dedicated made to measure menswear company, is reinforcing its long term growth strategy with an impressive new head office and a raft of senior appointments and promotions. The announcement, which follows a year of North American expansion, aligns with INDOCHINO's goal to become a dominant global menswear brand and reflects the company's commitment to attract, develop and nurture world-class talent. Situated over two floors on Granville St. and Robson St. in the heart of downtown Vancouver, BC, the 14,000 square-foot space is over twice the size of INDOCHINO's previous 6,000 square-foot headquarters. It will serve as home to INDOCHINO's more than 80 head office staff with plenty of room for the team to grow as the company expands. The open plan concept is reflective of the brand's ethos, with contemporary decor, numerous common areas and collaborative work spaces that encourage communication, innovation and creativity. 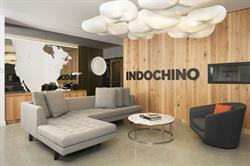 "INDOCHINO has evolved extensively over the past three years, becoming an omnichannel leader with a network of 17 showrooms in addition to our thriving online business; the spacious new office will be able to support our growing team and is the perfect venue for us to collaborate and implement our expansion strategy," said Drew Green, CEO of INDOCHINO. "These decisions are made easier when we see the level of execution, growth and profitability we are achieving this year. The move is reflective of my admiration for our entire team's work and our vast opportunities together in the months, years and decades ahead." 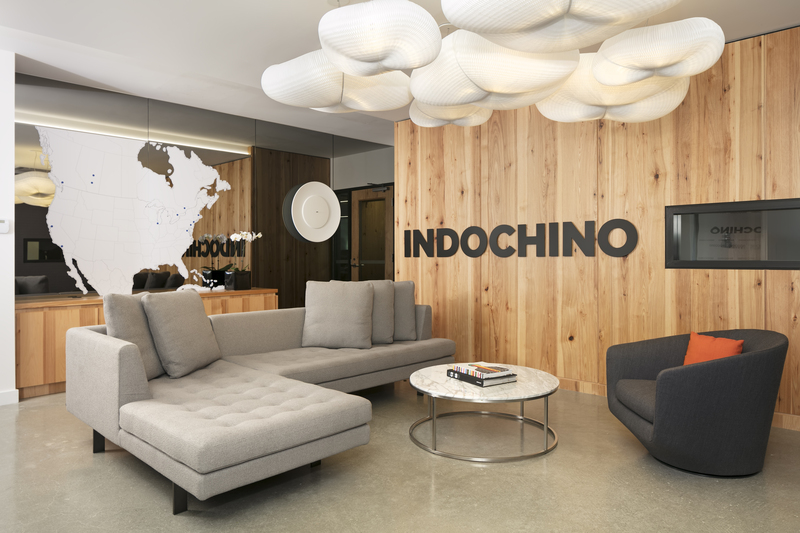 The head office upgrade coincides with a number of senior appointments as INDOCHINO consolidates its organizational structure in preparation for future omnichannel growth. With its retail model representing 50 per cent of business within two years of opening its first permanent brick-and-mortar store in 2015, the new positions will focus on growth and customer experience across all INDOCHINO channels. Peter Housley has been appointed Chief Revenue Officer; Michael MacIntyre, appointed Vice President of eCommerce and Omnichannel Strategy; Janet Jensen has been promoted to Vice President of Experience; Lisa Craveiro, promoted to Director of Acquisition and Natasha Moseley to Director of Project Management. The company has promoted 45 people in Vancouver, China and showroom management so far in 2017 and the news is further recognition of the talent the company has nurtured over the past couple years. Drew Green continued: "In order to continue scaling the business, it is imperative that we bring our most talented, experienced people into roles that will focus on driving omnichannel growth and further enhancing our customer experience. I am looking forward to continuing to work directly with Peter, Michael, Janet, Lisa, Natasha and the entire team as we continue to disrupt an industry together and deliver a unique and compelling experience to our customers." Peter Housley will transition from Chief Marketing Officer to Chief Revenue Officer, responsible for INDOCHINO's omnichannel sales and revenue performance. Over the past two and a half years, Peter has played a critical role in driving the growth to over 50% year-over-year from 2015 to 2017 through his dedicated and passionate leadership. The move will enable the company to take a true multichannel view to the planning, execution and management of its growth. Peter is a senior executive with President, CEO and CMO experience including retail, fashion, hospitality, digital pure play and consumer goods industries. He served as Chief Executive Officer and Director at Lavalife Inc. from 2000-2003, and returned as President from 2010-2011 to lead a subsequent M&A transition. He also served as President of Milestones Restaurants, prior to which he held retail executive positions at HBC and Eaton's. Michael MacIntyre rejoins the company as Vice President of eCommerce and Omnichannel Strategy. As the company doubles down on its omnichannel vision, he will work closely with Peter Housley to ensure digital channels are optimized for maximum growth. Michael is a seasoned business leader with over 15 years in eCommerce. Previously he worked in marketing and operations roles for Abebooks, an international online marketplace that was later acquired by Amazon.com, as well as leading marketing for Vivity Labs, a cognitive development company acquired by Rosetta Stone. Janet Jensen is promoted from Director of People and Culture to Vice President of Experience. With Customer Experience now under her wing, she will lead its evolution to ensure a customer-centric approach guided by INDOCHINO's core values. The company's longest serving employee, Janet has over 15 years' experience in human resources spanning a spectrum of industries, from technology to retail to legal, and brings to INDOCHINO a philosophy of people enablement. Janet's framework for both organizational development and solving complex operational challenges make her a critical member of INDOCHINO's Senior Leadership Team. This new role brings Janet's skill sets to the front line in an operational role. Lisa Craveiro has been promoted to Director of Acquisition and is responsible for leading INDOCHINO's paid acquisition strategy with a focus on driving omnichannel customer growth. For the last two and half years, Lisa has been instrumental in executing and optimizing INDOCHINO's marketing strategies and tactics across numerous platforms while shaping the content and messaging to engage prospects in all stages of the buyer cycle. With over eight years of experience in fast-paced, high-growth environments, she has also held roles executing digital growth agendas at leading companies such as Clearly and 6S Marketing. In her latest role, she will continue to focus on driving customer acquisition by managing the full-funnel paid media strategy, execution and optimization across a range of digital and offline marketing channels. Natasha Moseley has been promoted to Director of Project Management. In her new role she will focus on further developing INDOCHINO's project framework and process development to support the continuation of the company's growth strategy. In her role as Manager, IT Strategy, Natasha oversaw API and process integration with INDOCHINO's manufacturing partner, launched their next generation of pattern with the Fit Method program, and developed a technology strategy to implement an integrated view of the customer. With 10 years of project and program management experience across diverse sectors including education, engineering and retail, Natasha discovered her true passion for retail during her time at Kit and Ace, and is excited to continue developing and advancing INDOCHINO's project management disciplines. INDOCHINO has updated the traditional tailoring experience for the modern man. Inspired daily by the belief that men don't need to spend a fortune for custom clothing, the brand creates an elevated experience without the high price tag usually associated with made to measure. INDOCHINO is the first online company to disrupt the retail sector by delivering mass customized apparel to its customers and is now the largest dedicated made to measure menswear company. The company's multi-touch customer experience allows men to order their made to measure clothing online, via mobile or in person at INDOCHINO showrooms. For more information, visit www.indochino.com. To download images of the new headquarters and senior appointments, visit: https://www.dropbox.com/sh/4d6iiyorljpux72/AACHNWAvm8pFPfELNwr9c0Qba?dl=0.